Throughout scripture marriage language is used to describe the relationship between Jesus and his Church. Jesus is the bridegroom and the Church is his bride. This language is used because that is the exact relationship Jesus has with his Church. In fact, it is the perfect marriage and is the greatest example of what a marriage is to be for those of us called to that vocation. The bride is obedient to the bride groom and the bride groom sacrifices his life for his bride. The two are faithful to each other. They live and die for the other. This is the kind of relationship all married people are called to have and is the foundation of every successful and fruitful marriage. A common thought among non-Catholic Christians is that one does not need the Church. Salvation only comes from faith in Christ so the Church is no longer necessary. All one needs is a personal relationship with Jesus. It is true that we all need to have a personal relationship with Jesus but that personal relationship has to include a relationship with his bride as well. You cannot separate the husband from the wife and expect to get a full relationship out of the deal. How would that work in your other relationships? Imagine what would happen to your relationship with your best friend if you were to approach that friendship in the same manner. You know Fred, I love you and I like hanging out with you but I really can’t stand your wife. Can’t it just be you and I? Won’t you leave her to be with me? How would Fred respond? I can tell you without a doubt because I have made this mistake in my own life. My friendship, my brotherhood with Fred was destroyed because I had a problem with his wife. Fred and I did not speak for over two years and although we have mended the fence our relationship will never be what it used to be. Many non-Catholic Christians hate the Catholic Church. There is no limit to the vile words they spew out about her. She is accused of every great evil. How would you respond if someone said such things about your wife or daughter? Would you be forgiving and still have the most intimate relationship with that person? I know you hate my wife with utter contempt and I am ok with that. Let’s head to the bar to watch the game and have some drinks. I do not know who among us would not be infuriated if someone said the things said about Christ’s Church about our wives. Most of us would be ready to throw down, and with good reason. It is not only justifiable that we defend our wives but it is the duty of a husband to do so. So why should we expect any less from Jesus? If anything he is infinitely more justified to defend his bride from those who hate her. He is God, the creator of everything that is, was, and ever will be. He made all things good. He made the Church and took her as his bride. Who has the right or ability to attack what he has made? On the other side of the coin we have the multitude of Catholics who have walked away from the Church for any number of reasons. Many go to other non-Catholic Christian churches that they find more appealing. What are they actually doing when they leave Christ’s Church for another? What do you do when you leave your husband or wife for the company of another? That action is called adultery. The vow a Catholic takes at confirmation and then reaffirms at marriage and every week when they receive the Holy Eucharist is a wedding vow to Christ’s Church. We vow fidelity to Jesus through his Church. We vow to live our lives faithfully to him through Her and to die for them if required. When a Catholic willfully walks away from that vow they commit adultery. That is a grave sin, a mortal sin, which totally severs the friendship between God and man. When a Catholic walks away from the Catholic Church to have just a merely personal relationship with Jesus they end up with nothing for they shut themselves off from having any relationship with Jesus at all. When a Catholic leaves the Church for one founded by a man they lose everything. In the end they end up only with music they like better, or a better sermon, a better “experience”, or something emotional that drew them away in the first place. What they lose is Jesus. 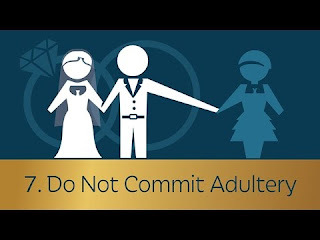 Thou shall not commit adultery refers to much more than just the physical relationship one has with their spouse. It also refers to the covenantal relationship with Jesus and his bride the Church. The two are inseparable.